I write a Monday Column every couple of months for 3 Quarks Daily. Previous posts are collected here. This is the latest one. He was a superb footballer and had played to near professional level as a young man. But in physics the tall, softly-spoken Niels Bohr was in a league of his own. German physicist Carl Friedrich von Weizsäcker said after meeting Bohr: “I have seen a physicist for the first time. He suffers as he thinks.”  Together with Ernest Rutherford, Bohr had mapped the structure of the atom, and later, in the 1920s, he helped shape the quantum revolution, despite strong resistance from its founder, the former patent officer from Bern – Albert Einstein. Einstein’s debates in the late 1920s with Bohr on quantum theory were like a scientific clash of the Titans. Einstein could never accept the indeterministic quantum mechanics that grew out of his own 1905 paper on the photoelectric effect. Bohr’s annual conference, to which he invited about thirty physicists, was the highlight of the physics’ year. From the 3rd to 13th April 1932, the brightest minds in physics gathered together in Copenhagen. In a few years’ time, many of these same physicists would be working on the atomic bomb. But for now, they still had time for a little light-hearted play acting. Each year the conference ended with what George Gamow called a “stunt pertaining to recent developments in physics”. The year before, Gamow had rounded up proceedings with a cartoon history of quantum mechanics, starring Mickey Mouse in the lead role. In 1932, as it was the centenary of Goethe’s death, they decided to stage a version of the German writer’s greatest play, Faust. Written when the industrial revolution was transforming Germany, Goethe’s Faust raises key questions regarding science and technology, questions such as what is the purpose of knowledge, and how can we have progress without increasing human suffering? Goethe’s Faust is a proto-scientist (the word ‘scientist’ was not coined until 1834), whose desire to know nature’s deepest secrets, leads him to strike a fateful bargain with Mephistopheles. In the sixteenth century, the story of Faust had been used by the Church to frighten people about the dangers of forbidden (i.e. non-Christian) knowledge. Goethe’s play re-works the classic theme for the modern age. His Faust celebrates the spirit of inquiry, while highlighting the dangers of misapplied knowledge. True scientific understanding, Goethe suggests, is life-affirming and creative, not destructive and exploitative. 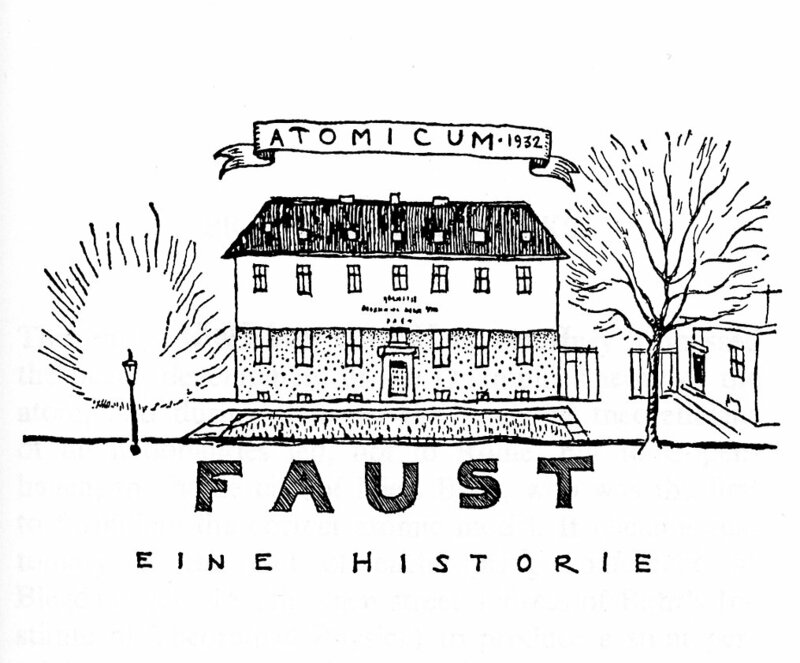 The 1932 Faust was re-written and, of course, greatly abridged by the younger scientists at Bohr’s conference. Their literary skills were no doubt boosted by the products of Copenhagen’s other claim to fame – the Carlsberg Brewery, which also happened to be one of Danish science’s most generous benefactors. Max Delbrück, who would later become a central figure in the post-war revolution in molecular biology, did most of the writing. The play is re-worked into what is essentially a humorous skit at the expense of the leading physicists of the day. Goethe’s characters were replaced with contemporary physicists, their younger colleagues donning masks to play them on stage. Mephistopheles became the irascible Austrian Wolfgang Pauli, while Faust became Paul Ehrenfest, a close friend of Einstein. The role of God was reserved, appropriately enough, for their host, Niels Bohr. Wolfgang Pauli’s rudeness was legendary. In the play he bluntly tells the painfully polite Niels Bohr (aka God) that his latest theory is “Crap”. But their gentlemanly host, Niels Bohr, is also gently mocked. His almost pathological fear of being too critical becomes the motto of the play, emblazoned on the text’s cover: “Nicht um zu kritisieren” (Not to criticize). Even Einstein doesn’t escape unscathed. His flawed unified field theory, which had created a media storm of interest when it was published in 1929, is lampooned by his young colleagues as the son of a flea. Faust is depicted as a proud, even vain, figure, one who is deeply dissatisfied by what he has learnt and what physics can offer. Mephistopheles tries to tempt Faust by convincing him to accept one of the more outlandish theories in quantum physics – Pauli’s own idea of the neutrino, a particle without mass or charge. If once he can make Faust say to such a theory “Verweile doch! Du bis so schön!” (Stay! You are so beautiful!) then he has won his wager with God. Within the annals of The Fourth Estate. Although humour was the last thing in Goethe’s mind as he penned this poignant scene, in the physicists’ version of Faust it becomes a wonderfully witty moment, albeit with serious undertones. The younger physicists are making fun of their colleagues’ vanity and self-importance. Indeed, by highlighting the theme of fame, they were making an important point: in the coming years nuclear physicists would indeed enter the public eye and feature ever more frequently in the media. After Hiroshima and Nagasaki were destroyed by the new scientific superweapon, the public would come to view scientists such as Einstein and Oppenheimer with both respect and fear. Eventually, as they were drawn ever closer to the government and the military, the price physicists would pay for their Faustian bargain was to be immortalized as Dr Strangelove, the ultimate doomsday man. At the end of the play, a physicist who had entered the media spotlight in 1932 made a brief appearance as Faust’s over-ambitious famulus, Wagner. James Chadwick is portrayed by his fellow physicists as “a personification of the ideal experimentalist”. 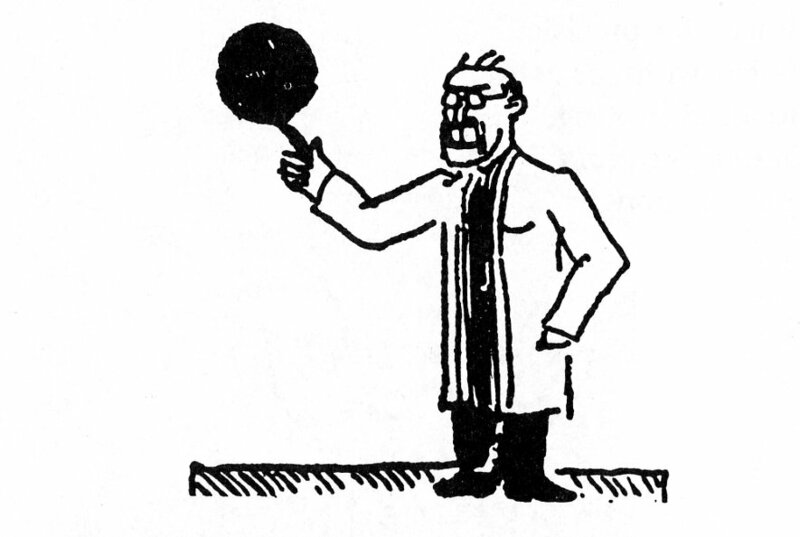 He walks on stage after Faust’s death scene wearing the scientist’s trade-mark lab coat and balancing a black ball on one finger. This rather sinister looking figure announces an extraordinary discovery, one of which Faust himself would have been proud. James Chadwick had found one of the basic constituents of matter: the third elementary particle after protons and electrons, the neutron. The discovery of the neutron, just before the Copenhagen conference, was a seminal achievement for modern nuclear physics. Its discovery made possible Leo Szilard’s idea in the following year of a self-sustaining chain reaction. Indeed there are Faustian echoes here too. For in 1932 Szilard read HG Wells’s novel The World Set Free about a Faustian scientist discovering how to release the energy locked in the heart of the atom. Szilard’s discovery helped open the door to the atomic bomb. 1932 was an important year as regards the science of the superweapon. Wernher von Braun was hired by the German army to design rocket engines, the first step on the path towards ICBMs. In the same year Harold Urey announced the discovery of a new hydrogen isotope known as deuterium. This would become the fuel for the hydrogen bomb. These are powerful reminders that the tragedy of Goethe’s Faust was about to be played out on a world stage. Clearly, the lessons of the play and of Goethe’s science were still profoundly relevant. In Part II, Act 2 of Goethe’s Faust, Wagner (Chadwick in the 1932 performance) uses alchemy to create not a neutron but a homunculus, a miniature man. In this scene Goethe criticizes what he considered to be a misguided approach to science. Wagner’s alchemistic attempt to create the homunculus combines allusions to both Paracelsian recipes and contemporary advances in chemistry, such as Friedrich Wöhler’s synthesising of urea in 1828. But significantly Wagner only succeeds because Mephistopheles is present. Goethe highlights the fact that Wagner’s approach to science is flawed and supernatural intervention is required to make it work. At the end of the play Goethe highlights the dangers of the misapplication of scientific knowledge. Thanks to the temptations of Mephistopheles, Faust has lost touch with the insights he has gained into both nature and himself. His overambitious attempt to reclaim land from the sea, a hasty and hubristic act which results in the deaths of the old couple, Baucis and Philemon, represents Goethe’s fears about the misuse of science and technology. It is one thing to understand the laws of nature – the forces that bind the universe – and to be able to control these laws. It is something else entirely to be able to use this power wisely. By performing Faust in 1932, the physicists created some intriguing parallels between Wagner and Chadwick, as well as the neutron and the homunculus. Goethe used the scene in Wagner’s laboratory both to belittle alchemy’s supposed achievements and to criticize mechanistic science for its hubristic attempts to play god. What, one wonders, would Goethe have made of Chadwick’s discovery of the neutron? Goethe’s notion that scientific knowledge and self-knowledge should evolve hand-in-hand, is a deeply suggestive theme when one looks at the history of twentieth-century science. What is the point of knowing nature’s deepest secrets, Goethe asks, if humankind never attains self-knowledge? The Faustian physicist might control the forces of nature but he does not understand, let alone control, himself. It is fascinating that the atomic physicists gathered at Bohr’s Institute in spring 1932 chose to perform Goethe’s play at this pivotal moment in the history of science. Six years later, one of the twentieth century’s greatest playwrights began a work that would raise profound questions about the purpose of science in the atomic age. After many revisions, the final version of Bertolt Brecht’s Life of Galileo was first performed in 1955. By then, as Oppenheimer said, the scientists had known sin and the world was living in fear of an imminent nuclear holocaust. This hugely influential play reflected the widely-held view that twentieth-century science was in crisis. Brecht’s Galileo is a Faustian character, who initially boasts that he would happily live out his life in a dark, windowless prison if he could but discover the secret of light. But at the end of his life, under house arrest and – like the aged Faust – nearly blind, Galileo has realised that science is about more than describing the laws of nature. Goethe would no doubt have been flattered that a century after his death some of the world’s most gifted physicists performed a version of his greatest play. He would, however, have been appalled to discover that soon scientists such as these would create weapons that could incinerate tens of thousands of people in an instant. Would he have been surprised though? I doubt it. Downward to consume us all. The issues surrounding the physicists’ Faust are discussed at greater length in my book, Doomsday Men: The Real Dr Strangelove and the Dream of the Superweapon, and in an article for the current issue of the Publications of the English Goethe Society, available to download here. 1. George Gamow, Thirty Years That Shook Physics, 1966; repr Mineola, N.Y., 1985, 51. 2. Cited in Richard P. Feynman, Don’t You Have time to Think?, London, 2005, xii. 4. John Canaday, The Nuclear Muse: Literature, Physics and the First Atomic Bombs, Madison, 2000, 268, n.
5. The Blegdamsvej Faust is on microfilm 66 of the Archive for the History of Quantum Physics (American Philosophical Society). An English version, together with the illustrations, is in Gamow, 165-218. 6. Bohr cited in Robert Ehrlich, Eight Preposterous Propositions, Princeton, 2005, 5. 8. H.G. Wells, The World Set Free: A Story of Mankind, 1914; repr. as The Last War, Lincoln, 2001. 9. P.D. Smith, ‘Scientific Themes in Goethe’s Faust’, in Paul Bishop, ed., A Companion to Goethe’s Faust, Rochester, N.Y., 2001, 198-99. 11. “Der Mensch kennt nur sich selbst, insofern er die Welt kennt, die er nur in sich und sich nur in ihr gewahr wird. Jeder neue Gegenstand, wohl beschaut, schließt ein neues Organ in uns auf.” Goethe, “Bedeutende Fördernis durch ein einziges Geistreiches Wort” (1823), Werke, Hamburger Ausgabe, 1981, vol 13, 38; tr. Douglas Miller: Goethe, Scientific Studies, Princeton, 1995, 39. 12. On Brecht and Bacon see PD Smith, Metaphor & Materiality: German Literature and the World-View of Science 1780-1955 (Oxford, 2000), 304; all quotes in this paragraph from Brecht, Life of Galileo, scene 14. 13. Life of Galileo, Scene 15; tr. Charles Laughton (Penguin, 2008). Absolutely fascinating... football, carlsberg, faust and physics all in one article. Perfect reading! I don't have a comment but need some assistance. I'm doing a reading of Micheals Frayn's play Copenhagen and need to pronunce "Blegdamsvej". I have no idea how to do it. Do you know or can you direct me to a website that can may help?